A wide-open 2011 NASCAR Chase and a track known for unpredictable auto action, the NASCAR Sprint Cup teams revisit the 2.66-mile Talladega Superspeedway. While qualifying for the NASCAR Sprint Cup Good Sam Club 500 is not an incredibly important ingredient to victory at the restrictor plate race track, a top starting spot improves the options early for drivers and teams. Drawing 42nd of the 47 cars qualifying, Mark Martin's and #5 GoDaddy.com Chevy swept past his Hendrick Motorsports teammate Jimmie Johnson for the top spot. 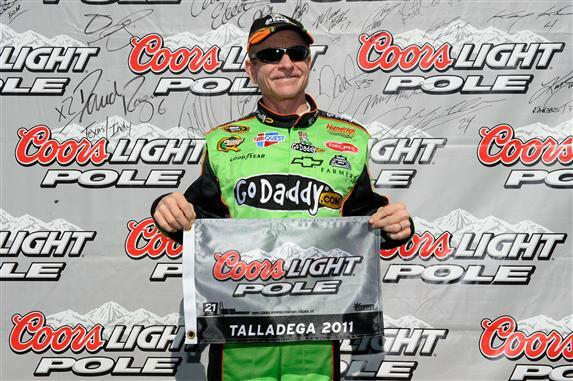 Lapping the 2.66-mile superspeedway oval at 181.367 miles per hour, this pole at Talladega becomes Martin's 50th in his NASCAR Sprint Cup career and first since the 2010 Daytona 500. A track Martin himself called "The Lottery", the Talladega Superspeedway race for the NASCAR Sprint Cup schedule his entire Hendrick Motorsports team is starting where the team left off following the spring event. With Martin and the #48 Chevy of Johnson on the front row, the remaining two cars of Hendrick Motorsports rests in the third row. Jeff Gordon starting 5th and Dale Earnhardt Jr in the field 6th, the four-car Chevrolet team is certified to be a race contender this fall event. In the second row between Hendrick Motorsports cars, the #33 Richard Childress Racing Chevrolet of Clint Bowyer along with the 2011 Daytona 500 winning combination of Trevor Bayne and the #21 Wood Brothers Ford collected mounted successful qualifying attempts for top starting positions. In 7th through 10th place starting the Good Sam Club 500 at Talladega Superspeedway will be Paul Menard, David Ragan, Carl Edwards and Ryan Newman. Weeks before Talladega, NASCAR announced a series of rule changes designed to lessen the use of the "two-car tandem" where a pair of vehicles are engaged in aggressive drafting. A new restrictor plate increasing power by up to an estimated 10 horsepower, NASCAR also prevented teams from using anti-friction lubricants on the race car's bumper. Some teams, namely the Richard Childress Racing organization, concocted alternative methods of 'greasing' the bumpers by using slippery tape and adhesives. The fifth race remaining in the 2011 NASCAR Sprint Cup season, the Good Sam Club 500 at Talladega Superspeedway is set to start Sunday at 2 PM Eastern time. Weather forecasts call for a warm and partly sunny day.